Discover the magic of Marrakech, the beauty of the Sahara desert, and the artisanship of the Moroccan people on this 8-day adventure. This once-in-a-lifetime retreat will take you through the souks of Marrakech to the desert of the Sahara and an ancient fortress with an art & culture focus. Arrive in Marrakech by 4 p.m. and be transported to your riad style accommodations complete with vibrant mosaics and atrium gardens. Rest up, meet your roommate, and join for our Welcome Dinner to meet your host and guides for the week. We will close out our evening with a grounding post-travel flow & meditation. After yoga & breakfast we’ll hit the road early for our Sahara Desert excursion. We’ll arrive at the striking Kasbah of Ait Ben Haddou, a UNESCO World Heritage listed city that once had a prominent position in the trans-Saharan trade route. We’ll enjoy lunch at a locally-owned restaurant before exploring the ancient village together. In the evening, we’ll stay just outside town where we’ll enjoy a grounding flow and a traditional Moroccan dinner. After yoga & breakfast we’ll hop back in our 4x4s for our next destination across the Atlas Mountains. We’ll drive a few hours before lunch then offroad our way into our Berber camp in time for yoga & a sunset camel ride. After settling in, we’ll stretch out with yoga before a delicious desert meal and campfire against a backdrop of stars & traditional Moroccan music. AAfter sunrise yoga & breakfast, the day is yours to choose your desert adventure! Stay at camp for R&R or get out and dune surf. Or, you can join for our group excursion to an oasis for a picnic lunch and games! We’ll reconvene in the evening for yoga, dinner and another night of music under the stars. After yoga & breakfast, we’ll say goodbye to our desert camp and hop back in the 4x4s. We’ll drive a few hours to our community partner, a women’s textile co-op where we’ll learn about crafting traditions that these groups work so hard to preserve while boosting the livelihoods of women throughout the area. After lunch there we’ll make our way back to Marrakech where we’ll enjoy an evening grounding meditation after dinner. After an energizing morning flow & breakfast, we’ll start our explorations of Marrakech’s vibrant souks (markets) and see some of the city’s landmark sites including the Moorish Medersa ben Youssef, the opulent Bahia Palace and the picturesque Jewish Quarter. You’ll see the infamous Jemaa el Fna and have time in the afternoon for your own explorations before evening yoga. Dinner is on your own tonight to choose from the many options Marrakech has to offer! We’ll follow yoga & breakfast today with a special visit to a hammam, or spa, where you’ll soak in the baths and receive a scrub treatment and have options for massage. The rest of the day is yours for shopping & exploring before evening yoga and our farewell dinner. After yoga & breakfast, get an early start and hop the train to Fes, a beautiful, ancient city full of hilly riads, art and architecture. You can pack snacks or get lunch on board before arriving mid-afternoon to our ornate riad located in the medina with panoramic terrace views. You’ll relax with afternoon tea & treats and have time to watch the sunset on the terrace and a chef-prepared 3-course Moroccan dinner. TToday you’ll explore the ancient medinas of Fes with our local guide who will show you the incredible craftsmanship of the town, from tile making and pottery to metal working and textiles. We’ll see the spice souks and tanneries and have time for a stop at a local hamman(spa). You’ll have lots of places to choose from for lunch & dinner, either eat-as-you go street tastings or full-on Moroccan family style meals. 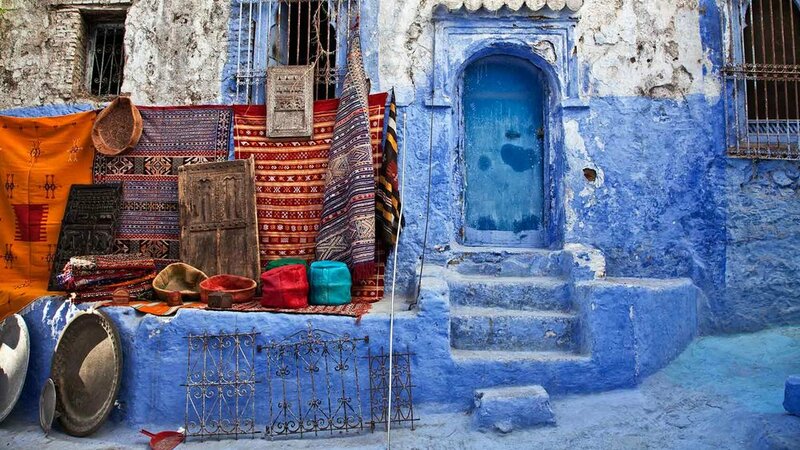 You’ll head out after breakfast for the “Blue Pearl of Morocco,” the magical blue city nestled in the Rif Mountains. You’ll have the full afternoon to explore the Old City & Medina, do some shopping and snacking, take photos, or rest up in our local riad. After an early breakfast, you’ll head out to the Tangier airport, about 2½ hours from Chefchaouen. Plan your departure flight for after 1:00 p.m.
+$895 Surf add-on April 28-May 2 (4 nights). Beginner & advanced options available. October 2019 Originally from Austin, Texas - Jade Witham moved to Morocco in 2014 and has been discovering the country and its amazing culture ever since. A lover of travel, food and yoga - in no particular order - Jade spends her time making friends all over the world, planning her next travels and expanding her yoga practice. Jade has attended yoga teacher trainings in Morocco and India, which has helped her develop a unique teaching style with emphasis on fun, self-love, body positivity, and curiosity. April 2019 - Angelena’s love for yoga began a decade ago when she started it as away to stretch her body and support her active lifestyle of hiking & surfing in Hawaii, where she grew up. Over the years, yoga became a healing practice where Angelena found she was able to find space for herself, listen to her body’s needs and stay present through constant change. Angelena’s classes focus heavily on alignment, breath technique and self-awareness and often end with a short mindfulness meditation and singing bowls. Angelena was our instructor for the May 2018 Nicaragua Yoga + Surf retreat and teaches weekly public classes in Austin, TX. Please refer to registration for complete terms. Payments can be made either by 1) full payment on booking 2) $250 deposit on booking + payment schedule per registration. Payments will be invoiced via e-mail for credit card or Paypal payment online. To pay by check, please indicate on registration and make check payable to Traverse Journeys and send to PO Box 40516, Austin, TX 78704. $250 deposit due on booking. 50% remainder due 30 days from initial invoice. Balance due 30 days prior to trip start. Cancellations, less the trip deposit ($250), are refundable up to 90 days before trip start date. Please refer to the full Payment Plan for details. Trip protection-style travel insurance that includes travel medical coverage is required for all trips with Traverse. The coverage must have a minimum $200,000 of medical coverage and include injury, medical, evacuation, and repatriation. Most domestic US health insurance plans do not cover international travel claims or provide a global network of contracted doctors and facilities. We want to make sure you are covered in case of an emergency or non-emergency illness or injury while abroad. Trip protection coverage protects the investment of your trip, including benefits for items such as trip interruption, trip cancellation, delays, baggage and personal effects, and more. We do not have a required coverage amount, but typically coverage is based on your trip costs. We partner with Wanderwell, a B-Corp Certified provider who can offer both Travel Medical and Trip Protection. If you choose to purchase through Wanderwell, you can buy the trip protection directly from our Traverse Journeys partner page provided in your Welcome Pack, and a portion of your purchase will be donated to WeForest through 1% For the Planet to aid with carbon offset for your trip. With Wanderwell, the TripProtector Classic and TripProtector Preferred plans meet our minimum requirements for coverage. Once insurance is obtained, a copy must be sent to Traverse. Failure to provide proof of insurance within 30 days of booking will result in trip booking suspension until proof of insurance has been provided. Traveler is responsible for all required travel documents including passport, visas, entry or exit fees, and vaccinations. Traverse does not cover the cost or assist in obtaining any of the above, and reserves the right to collect information on all.